MP Class: Conventional U-shaped MP class Molybdenum disilicide elements may be heated to 1900°C. The MP1800 type elements are more commonly used and are able to achieve 1830°C. (see table below). ** This is recommended temperature for modern three layer insulated furnaces like MHI furnaces when new. Note that the recommended temperature will be lower for furnaces which are not insulated well or have aged considerably. MHI also offers custom elements able to meet your power and control demands, so you can focus on business. MHI can design and manufacture a solution for your heating needs. Contact Us or call 513-772-0404 to request more information or a copy of our Element and Furnace Handbook. 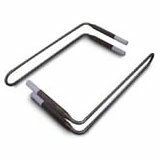 MHI offers a complete array of replacement heating elements for high temperature ovens and furnaces. PETROX-EC™ coatings are standard in MHI furnace's elements. This coating allows for a more efficient electrical contact and lower terminal temperatures thus ensuring longer life and providing an energy benefit. 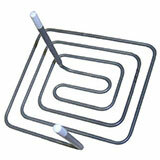 MHI also offers high emissivity heating elements -E labelled. * The life of materials varies and depends on conditions of use. There are no guarantees nor has MHI tested in all conditions. We do offer small lot purchases so that you can try in your application. We have testimonials which lead us to believe that we are a well-known good supplier.